Small business owners may not have the financial resources to hire employees to help customers or to oversee operations. Therefore, they are responsible for customer service and other tasks that need to be done to keep the business functioning. However, it can be a good idea to delegate the task of keeping a company's financial records in order. Business owners need to know how much they make in a given day, week or year. They also need to know if the company's revenues are more than its expenses. Having a basic understanding of a company's financial health can help an owner maker decisions that can make it profitable now and in the future. With the assistance of an accountant, it may be easier to see how a business is doing financially without taking a lot of time or effort to do so. Ideally, you will spend your days making new products, talking to customers or otherwise helping your business grow. Without an accountant, you may instead spend your days in an office making spreadsheets or trying to figure out how to use a software program. Even if you like working with numbers, the less time spent doing math means more time getting a new investor or corporate partnership. A Las Vegas CPA can perform as few or as many duties as necessary. 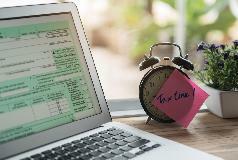 Even if you just need someone to help with tax preparation for a couple of days each year, it is important to know where to go to get that assistance. This is true whether your company just made its first sale or makes millions annually.